Acrylic panels from Allplastics Engineering contribute to the trendy new aesthetic at the YO! Sushi restaurant in Sydney Airport. Specialising in sushi and Japanese street food, the YO! chain of restaurants began 20 years ago with the mission to bring fresh, authentic Japanese food to London. The chain now operates restaurants in over 100 locations across the globe. YO! Sushi’s promise of freshness and authenticity is aligned with a deep-rooted commitment to minimising their impact on the environment. In addition to avoiding endangered varieties of fish, the restaurant chain also offers several vegetarian options on the menu. 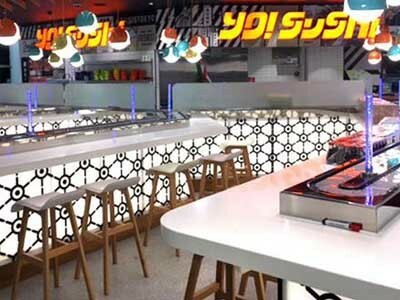 Allplastics supplied acrylic panels to DCB Development for the ‘YO!’ fitout at Sydney Airport. Phil Abbiss, National Project Manager at DCB explained that they fitted their airport location with custom-made 10mm clear acrylic sheets featuring polished edges and backlighting for an enhanced effect; translucent film was applied to the back of the acrylic behind the pattern graphic. He added that Allplastics capably cut and polished the panels in a very tight timeframe. Allplastics offers a range of products that can add the ‘wow factor’ to your next hospitality or retail project: Clear Acrylics, Perspex Frost, Plexiglas Satinice, Perspex Naturals, Dekodur High Pressure Laminates, Coloured Euromir, and Metaline Cladding Panels.